.Tea of the week from teapigs | Liquorice and Mint. This week’s tea from teapigs is a little different to the others – it’s a sweet one! I didn’t think super sweet when i looked at the package, I was expecting a minty tea with a slight aniseed flavour to it, instead it got a mouth full of something a whole lot different! This tea is one for those afternoons when you’re feeling in need of a sugar boost and don’t want to raid the office sweetie tin. It taste like a mint tea with a whopping spoon of sugar and a block of liquorice dunked in, i mean this stuff is really sweet. If i’m honest i’d have to really be in the mood for something sweet to pop the kettle on for this one, but if i was then it would be spot on. In usual teapigs stylee the temple diffuses the teas perfectly into your hot water and it’s instantly yummy. It smells like a mint tea which is why the sweet taste is quite surprising – i may have even exclaimed a little ‘OH’ when i took my first sip! 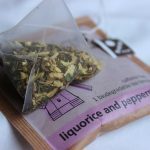 If you’ve got a sweet tooth and like minty liquorice flavours then tea is perfect for you, if you’re looking for something a bit stronger then i’d point you in the direction of teapigs peppermint flavour instead! 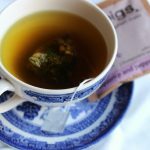 You can buy teapigs Liquorice & Mint tea from their website HERE starting at just £1.19 and don’t forget you can also get 15% off with the code BLOGGERS12 – go go gooo! Have you tried teapigs liquorice & mint tea before? Does it satisfy your sweet cravings? Keep your eyes peeled for next week’s tea of the week from teapigs!